Synthetics are a perfect match for oil and acrylic paints in a classroom setting because they're easier to clean than natural hair brushes. They are more durable, and they can withstand the harsh elements of acrylic paints, with less damage. This affordably priced synthetic brush is a logical choice that can handle everything from detail painting to bold, sweeping strokes. Best of all, it's available in classroom packs that offer an assortment of sizes at substantial discount. The natural wood handles have a green gloss finish, with seamless polished aluminum ferrules. Ferrules are double crimped. Assorted Shapes, Canister of 144 — Contains 144 brushes, including Round brushes in sizes 1,2, and 4 and Flat brushes in sizes 1/4, 1/2, and 3/4. Flat, Canister of 40 — Contains 40 Flat brushes, including sizes 1/4, 1/2, 3/4, and 1. Assorted Shapes, Canister of 60 — Contains 60 brushes, including Round brushes in size 6 and Flat brushes in sizes 1/4, 1/2, 3/4, and 1. Assorted Shapes, Set of 6 — Includes one each of Bright, sizes 6 and 12, Flat, sizes 1/4" and 1/2", and Round, sizes 4 and 8. Round, Class Packs of 72 — Save on a huge assortment of sizes, enough for the entire classroom. 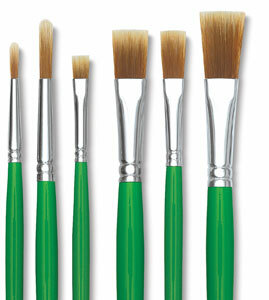 Blick's class packs of Economy Golden Nylon Brushes contain 8 brushes each of sizes 0, 1, 2, 4, 6, 8, 10, 12, and 14. Round, Set of 6 — Save on an assortment of sizes, including sizes 0, 1, 2, 4, 6, and 8. 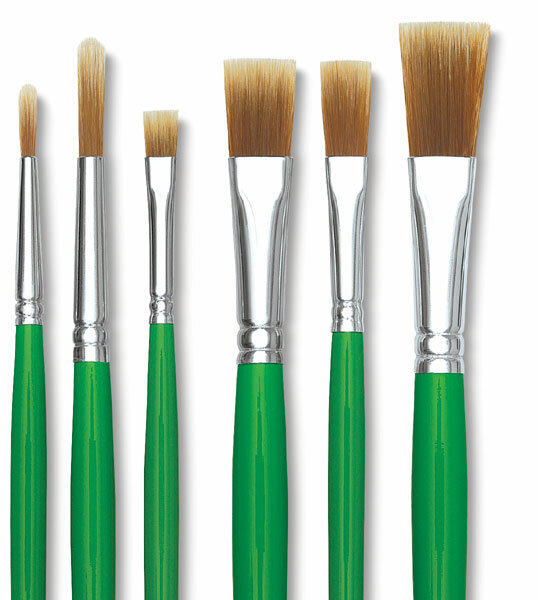 Flat, Set of 4 — This set includes one brush each of sizes ¼", ½", ¾", and 1".